In this great action game you will have to defend your castle walls. The character you will play is a mighty wizard called Frostorn and you are the ruler of the kingdom. Unfortunately a brave knight felt the need for power and now Morokwar is trying to conquer your throne. He has a vast horde of orcs and he is coming to attack your walls. Move from location to location and defend it with your summoner powers and also with the units you can call. Gain skulls for defeating the horde and upgrade your defense, offense or reinforce the units you can summon for battle. Always hit them with your powers and dont make sure they wont break through to the first floor or it will be tough to win from that point. 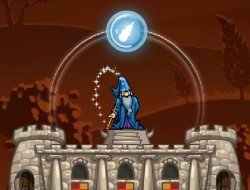 Use the mouse to activate your skills and the number keys to switch between spells. Epic Stand 0.00 between 0 and 10 based on 0 votes.